The PERFECT Preschool! Know what your child needs. Best Program: I believe children learn best when they have standards placed for them in the classroom with teachers as facilitators, who provide open ended lessons to achieve designated goals. I believe children can excel if put in a classroom with high expectations, nurturing guidance, developing an intrinsic motivation and understanding of rules. Exposing children to many different ideas , new concepts and old ones, helping to solidify knowledge to build a foundation of academic curiosity. I think children are capable of reaching higher goals with the knowledge that is carefully placed when developmentally appropriate. Make learning fun, so children can be busy learning new things, experimenting, finding out about the world, and how it works. Strengthen the love to learn in all children by making learning fun building in strategies to solve problems. Children need a good foundation of knowledge that is embedded in lesson plans motivating them to get answers, build curiousity, and gives them new experiences my the first couple years of life. This foundation transfers over into academic motivation, curiosity of learning and respectful attitudes. The young child is extremely receptive to absorbing large amounts of information, internalizing it, and using it later when needed. Children need a strong foundation of early experiences to build intelligence later, by formulating multiple ideas together. Children need consistency, firm direction, and academic scaffolding to establish a strong educational career. An emergent curriculum that scaffolds knowledge while allowing the child to explore new possibilities. Flexible child-directed curriculum that enhances new ideas and expands old ideas is ideal for the growing brain. As the teacher I believe I plant the seed of knowledge and curiosity to set the child in the open sea of exploration. The expansion of the mind by performance, accommodation and process wills the child to reach a higher level of thinking. Letting the child come up with new concepts and ideas teaches independence and advanced cognitive skills. The effectiveness of curriculum can be judged by how students process information. Do they ask advanced questions ,demonstrate higher level of thinking by relating various objects and ideas together, can they demonstrate imagine learning by brain recognitions, letter decoding and relativity to achieving academic / social emotional goals. How does the whole child learn? Is she/he advancing in several domains? Is he growing in his academic performance through advancing fine motor skills (cutting, pre-writing letters, hand strength), is he building cognitive knowledge (does he know his ABCs, numbers, name), is he beginning to understand related ideas (freezing water turns to solid-ice); social emotional development (does he handle conflicts) is he growing with new knowledge? Management strategies: Redirection is one of my most frequently used disciplines- removing the child from the conflict. Music for transitions and calming down, opening in the morning with conversations and chat, and changing toys for newness and exploration. I manage my class through time management and space management. My strategies for managing the children are all about engagement, if they aren’t busy and happy, it is because the teacher has failed to provide the correct stimuli. How do children get creative? It is quickly becoming a lost ART. The creative ability in children begins early, by increasing the child’s awareness of materials, allowing freedom of messiness and having open ended projects for the children to participate in. The creative mechanism in the child’s brain likes to explore by feeling textures , seeing new color combinations, or tasting something sweet, these really make a reaction that is pleasing to the child. 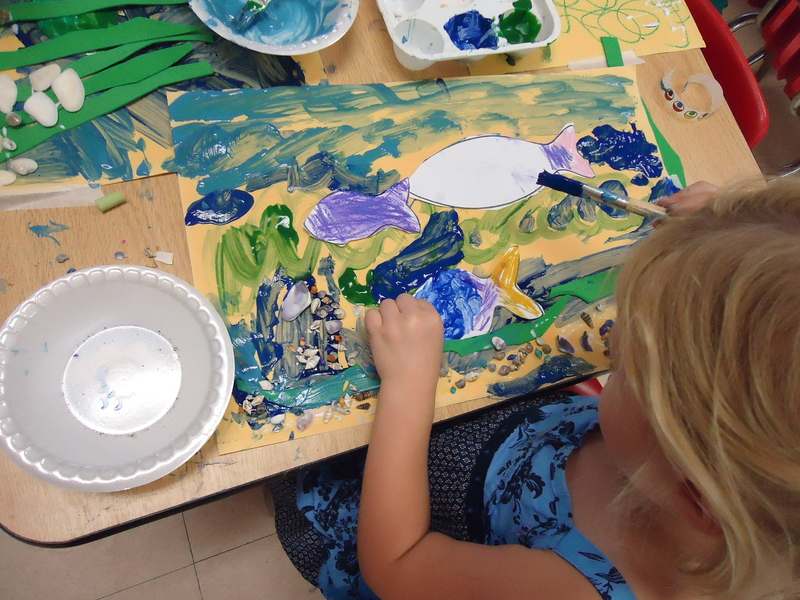 It is important to allow the child to express themselves create and evolve into a higher level of creativity. 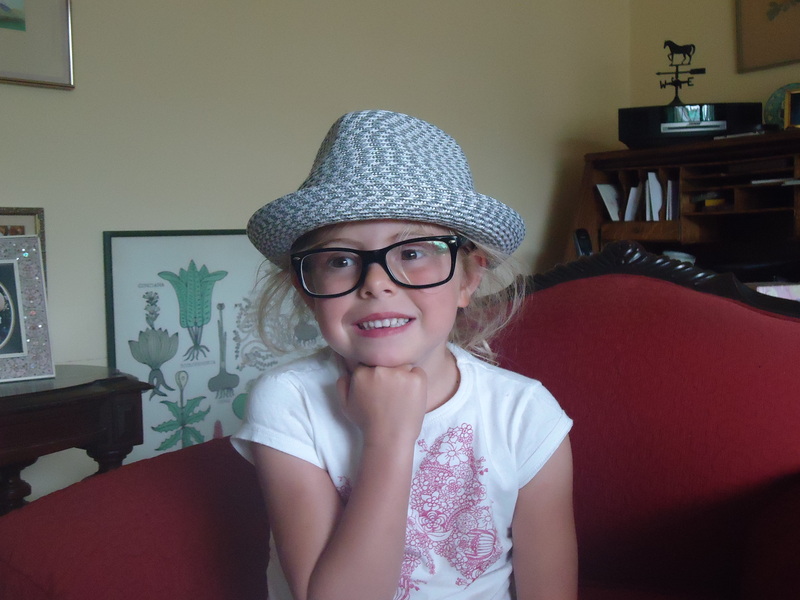 Usualy at about 3.5 years the child can calculate an idea and think HOW to make it. Creating a treasure box,an open art drawer,a bend that is owed by the child for exploration is important at the first stage- things like tape, baby scissors, markers,pencils, crayons, payons, paints, buttons,spools, thread, glue, torn paper , stickers, crepe paper, bubble wrap, twine, yarn, glitter, popsicle sticks, old puzzle pieces, rubber bands and so on. Change the items periodically. Bag up some unusual items in a small baggie for the child to look at and put together, as an invention. (Hardware items work well for this project- screws, pieces of wood,paper clips, nail files,springs, old box box stuff). Help plant ideas in their head, by giving suggestions, showing them the way a nut and bolt go together- wrapped with aluminum foil, then sprinkl with glitter. Set up a special area to let the child , just play with new items- study them, stack them, sort them. Most of the time children haven’t been allowed to play with these types of things- watch them explore. Thinkig alot, what to put in the painting. What a simple ideas to enhance creativity! Teachers it is easiest to set aside a free area in your class , with an open ART drawer- you can put all your reject pieces of collage paper, toothpicks, paper, old magazines, poms, beads and so on. Label it largely and clearly and tell the children what is it for- free OPEN ART, whenever they chose! I have downloaded some of my open art project- totally child directed. How do children express themselves? 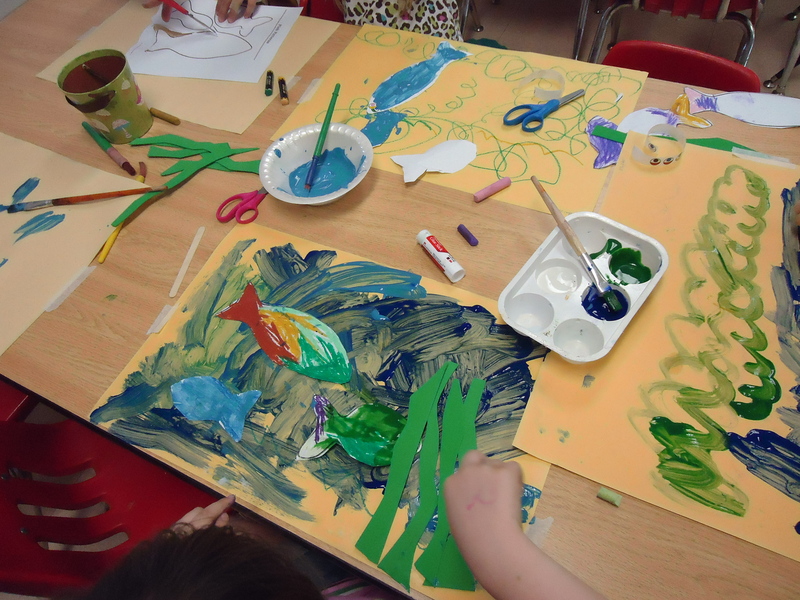 Let the fingers do the walking, allow the children to create creatures using their fingers. 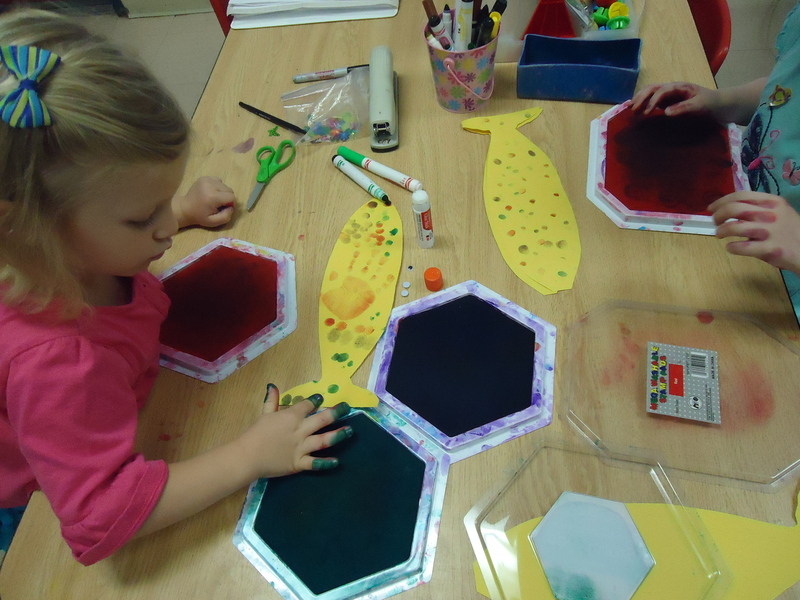 Dotting, smearing, making hand prints ,all of these movements allow the child to see an immediate art project. The creative ability in children begins early, by increasing the child’s awareness of materials, allowing freedom of messiness and having open ended projects for the children to participate in. Some children work hours on projects creating endless paint messes, blobs of multi colored paint, piles of glitter, it can be frustrating for the teacher or parents, but this is creative thinking happening! Creative ability , I believe is inherit and can be reinforced as positive or negative. It can be a tactile mechanism in the child’s development to feel and become aware of a new substances, textures , colors or to experience a beautiful visual response. 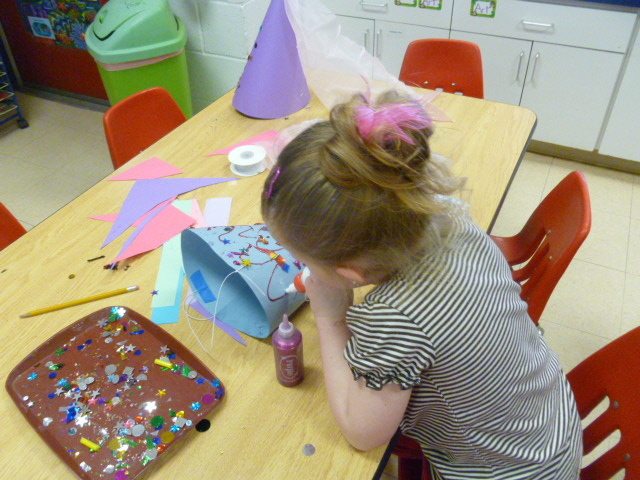 It is important to allow the child to express themselves, tinker, create, evolve one item into another . The scales are made with fingerprints, sequins or glitter- precut fish make an easy project. Add wiggly eyes too! Preschool is more important than you think! 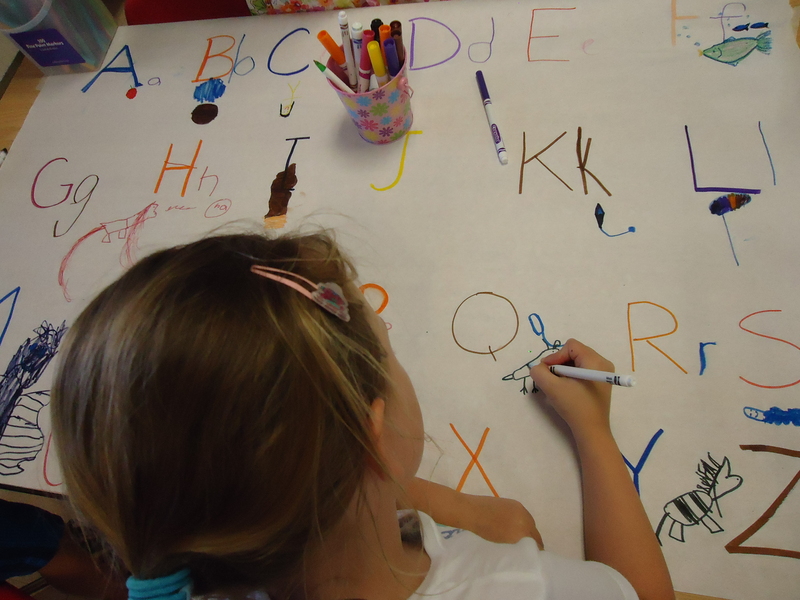 Going to preschool is the first step of the child’s education, it is important to chose a preschool carefully. Building knowledge, experiences and trust becomes the foundations of the first couple of months in school. I teach developmentally appropriate education and really believe it is the correct foundation for the young child. National education for the Young Child, NAEYC,is the development.ally appropriate practice that I like to follow. I associate this philosophy with State Standards and produce a creative magical program for children. I believe children can learn anything given the correct learning tools. Children love learning and teaching is an inspiration.